"Super Mario the Green Stars" is a Super Mario 64 ROM hack made by Kampel125. Major differences include harder levels, an increased star count of 130, and green stars! This movie uses romhack version 2.1. There are many wall clips that could be abused in earlier versions, but the most significant change in this version is the introduction of course-exits. In some romhacks (like Super Mario 74), when Mario collects a star, he is then thrown out of the stage into a central point of the hubworld - for each and any star from courses in the current hubworld. Green Stars 2.1 has exits for all courses except Bowser Keys and Secret stages (stages whose entrances are within other stages). This significantly improves the time the game can be completed, well beyond what the wall clips would offer. There is a singular reset in this movie to clear the cache(?) of koopa to prep for his star. You can read more about this in my Cloudy Quadrangle (stage 14) description. The reset would otherwise not be required, and is also slower, had we not needed to accomodate for this single star. The backwards longjump glitch (known as blj) is abuse of a coding error in which Mario's backwards speed is uncapped. If you can longjump while going backwards in a spot where you gain little or no air between jumps, you can accumulate a large amount of negative speed to use to traverse the stage or convert into forward speed under special conditions. Nis: I started this project solo back in 2014 when I was still learning sm64 tas. I have some videos of those runs on my youtube channel, but in all honesty they are pretty bad. This project got more serious when Homerfunky asked me to do a 100% sm64 rom hack with him, and I had told him I was already working on one. This run is the result of that conversation, and almost every single star that I had attempted the first time around was improved. The project was officially finished in Januaury of 2017, but i was really unsatsified with the beginning stage(s), mostly the first stage. This was the stage that everyone was going to see first, and it was really slow, and the beginning star wasn't even entertaining. I made the call to go back to that stage to rearrange the order in which we do the stars, in addition to improve them all. We saved over 30 whole seconds on the first stage alone doing that, but would also cause any RNG-dependent star henceforth to desync. So, we redid them all as they came, and improved whenever a desync happened, or if we felt a particular star wasn't up to snuff - since we were redoing things anyway, it wouldn't hurt to improve a bad star then and there. Thankfully, the reset which occurs at 86 stars resets all RNG and Global timer-dependent variables, so everything from the reset onward synced properly after the improvements were made earlier. In hindsight, i think there are still a number of stars that can be improved a bit, but overall i am satisfied with the final product. This is the first stage we enter and the stage that was done from scratch about 4 times. The first time was my solo attempt - which was good by itself but needed some heavy improvements. Big shoutout to MarioGohan (Gohanie) for helping my tasing in general at the time, but also improving the blj for the 2 hyper-speed wallkicking (HWSK) as his own uploads. I would go on to mimic and improve upon his run for this stages star 5 and 6. There was a massive route-change for the 100c star on the 4th time of redoing this stage which ultimately saved 20 whole seconds on this star alone. We also used the new trick of spawning coins from a post by doing a very precise circle around it whilst on top of the pole, rather than running around the pole. Shoutouts to Eru (aruaerueru) for originally posting about this new tech. The strange walking sequence you sometimes see before we kill a Whomp is rng grinding for usually the incoming coins, and also sometimes other coins (like the blue coin from the pirhana at the very end). I appreciate the work Kampel put into this hack, but this stage in particular is extremely lackluster and plain. It's a big field with a 2 or 3 objects on it. Overall we did well. I'm not sure how the king Bob-omb is coded here, but i believe his mechanics are different than vanilla sm64 so the method to killing him is slightly different. Shoutouts to DennisBalow (Haru) for also helping me with tasing and a few stars on this stage when i had done it solo back in the day. I don't like how ugly/slow the 100c looks around the pirhanna plants/goombas part, but there just isn't enough coins otherwise and there's no easy way to stay within the plants' range to spawn the coins without just standing there waiting for them. Slight route change for star 6 due to finding out about the roof-clip. One of the first stages I was satisfied 100% from start to finish. Everything looks clean if i do say so myself. Shoutouts to Plush for finding out about the neat little tech used on star 3 where mario does a 2f backflip from a standstill. The entrance to this stage is located behind a pushable cube within the Fiery Factory stage. 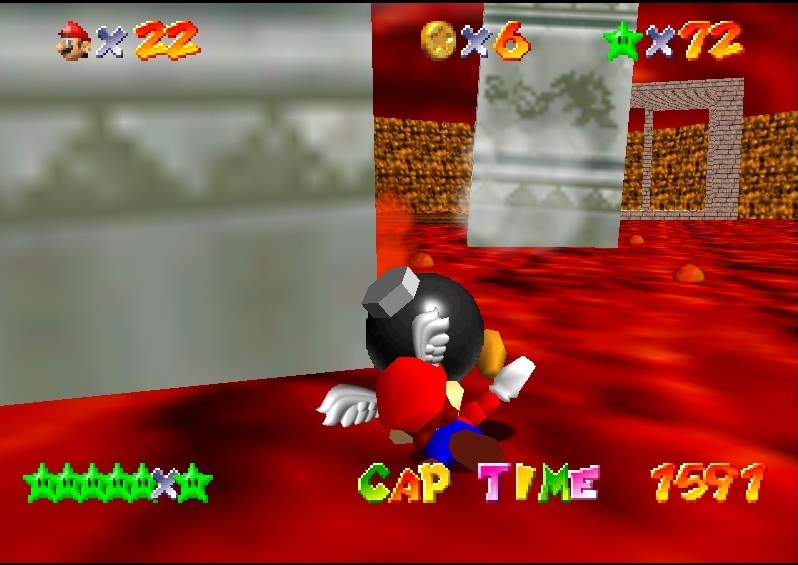 We actually spent quite a bit of time on this part, because I didn't like the cube-pushing part and thought it was really boring to watch Mario push a cube for 10 whole seconds. I desperately wanted to find a way to get into the stage in a more entertaining set of moves - but most importantly it needed to be faster than the fastest we could get in with pushing the cube. The first idea was to use Paralell Universes (PUs), but due to an extension made specifically for romhacks, PUs in them are 4x as far apart as vanilla sm64. This makes going to them, and subsuqeuntly using them for precise movement, incredibly tricky and difficult. I did manage a PU route, but the platforms i landed on were never high enough to land into the entrance of the stage. In hindsight, with my better knowledge of PU mechanics now, i may have been able to enter the stage from a completely different location via PU, but it probably would have been slower anyway. The blj on this 2nd elevator was not faster than the pushing block for a long time, and we spent a few days trying to find out a way to make it faster. At the very end, before we gave up, i accidentally did too many bljs than we had intended, but it turned out there was a tiny platform to land on during movement to the entrance that mario ever-so-slightly tipped his foot onto that gave us just the right positioning to get into the stage about 20f (2/3 seconds) faster than the pushing! I was very happy that we were able to do a non-pushing entry for this stage. As for the stage itself, i was never a fan of forced-metal cap usage via lava bouncing. Shoutouts to Circumarc for assisting in the routing of the 8 red coins star for this stage. Swimming stage. This one uses the most inputs of my original runs than any other stage, mostly because nobody likes to TAS swimming. Among the improvements are The Top of the Cave star which Homerfunky used Plush's record as a benchmark, and a route change in the 100c star which switches from using a blj to clip through half the stage to just swimming. This was originally an attempt to resync the rng (RNG calls very fast when swimming) back to where it was before the 20 second save in stage 2. Ultimately, there were other factors that contributed to RNG calling (global timer) that made these efforts futile (I had synced the rng but the run still desynced). Since the blj used the releasing of the purple switch, it took awhile to setup. Swimming normally ended up being about 0.5 seconds faster. This was where all swimming revisions from the original inputs were made. Shoutouts again to MarioGohan for giving me a benchmark for the first star (try to) beat. The first star here uses a trick called Death Star Glitch (DSG). The only dying-state in which Mario can still collect stars is out-of-bounds (OOB). In the first star, I blj under the ground where a body of water is. I then swim OOB to the death barrier. After triggering the death, i swim back inbounds to collect the star hidden in the cave. This lets me omit the stardance and the "collected a star" screen after a stage, but i still get credited for collecting the star. In a single-star setting, this is slightly slower, but overall saves about 4-5 seconds in a full game run. For the King of the Mountain star, we redirect our blj speed twice. Firstly, we leave the water to turn our blj speed forward. Normally, this is enough. But, the star we're tring to get to is at about a 150 degree turn from where our original blj direction is. Speed redirection can give you a maximum of a 89.99 degree turn. Best-case scenario, we could just not enter the water and instead circle around and then talk to pengu, but there isn't enough stage for the speed at which we're going to do that. So, after we exit the water at about a 70 degree angle, we immediately talk to pengu. Now, after talking, we can change directions up to 89.99 degrees a second time, giving us the much needed hard-turning to angle towards the star. For the Baby Penguin star, Homer uses a glitch called handsfree in which Mario can hold an object as if he had nothing in his hands, allowing him to do jumps and other movements that don't include walking (walking will ruin your handsfree). This normally makes it really hard to change directions during handsfree. We knew of the clip in the wall there, so Homer jumps through it. Originally, we would clip through and then jump into the aforementioned water and swim the pengu to the momma penguin. However, Homer found that a triple jump could reach the slope on the other side - which also lets us change directions during handsfree. Now we could use this stored speed to reach pengu, do a handsfree dialogue box drop to drop the penguin instead of setting it down, and conserve the speed to the star. Really nice. Mostly done by homer. We really wanted to do Hyperspeed-flying (HSF) here, but there just wasn't enough geometry in the level to get a triple jump during our hyperspeed. I was able to find a really clutch spot where it might be possible, but i was never able to get it off. Homerfunky, as seen in the run, got the spacing and speed just right to land on the backend of that large platform to take off. It was really great when i saw him pull it off because it definitely makes the run a lot more entertaining. The starting GWK over the gap is faster than the original 0star attempt done by both Homerfunky, MarioGohan, amongst other TASers. The blj spot in the boxes is really tricky to do without breaking your box. In star 2, you see some strange movements - notably a lot of jumpkicking. Speed preservation is really good on this slope, so no speed is lost. Most imporatntly though, this is RNG grinding. Dusts = rng. Since this star's time is gated behind the position of the elevators, we have a lot of time to waste for something like RNG grinding. RNG grinding was used here to manipulate the position of the Thwomps for the next star on this stage. So this starting blj is really interesting. Getting this first star normally is slightly faster, but opening this cannon is a real pain for any star that actually has to use it. So, what we do is do a side-blj (sblj) on the discrepancy between the height of the covered cannon and the surrounding floor, and then use the cannon-opener (which eliminates the only blj spot in the stage) to redirect our blj speed towards the star in question, while simultaneously opening the cannon for the other stars that need to build up enough speed to clear the double jump up to it. You can see the speed-building in question in the following star. This double jump just barely makes it up to that platform with that speed, so it's really important that no stars that use this cannon open said cannon, otherwise they couldn't build up all this speed optimally enough to make used of the jump. The blj on this tree was phenomenal. Homer originally had a blj here, but it was on the tree behind it, and on a different angle. I able to use blj on the closer tree and slam ever-so-slightly into the building so get us in just the right spot to grab the tree. Homer would then vastly improve the speed in which we start the blj on this tree and make it look super clean. That is important because this blj is used for 5/6 of the stars. Slight route change since the goombas in the underground place were in a terrible spot, so instead of the 8th red coin being the 100th (and also changing my direction optimally when swimming), i now kill a shyguy towards the end (which took a consderiable amount of effort to position). Overall, i was happy with the route change there. The chuckya clip was known, but greatly improved by Homer. He got the clip to work flawlessly with breaking out of the chuckya's grasp, rather than having mario's knockback of throwing the chuckya to clip him. This saves a lot of time over the rta method. Subtle RNG grinding is done during the end of the Wiggler fight (disguised as entertainment) for both the resync of the chuckya star right after, as well as different position of coin spawns during the 100c star several stars later, as this is the only place we can change moves without losing time to do rng grinding. The pirhanna plant star here is really disappointing. So, we had a really nice looking blj route going here. Unfortunately, you need to watch the plants die or else you don't get credit towards the star. This means we'd have to sit around a bit with our blj speed, and the time it takes to get into the blj just makes it slower overall. You can even see this towards the end right before the last plant, i do a weird set of movents that isn't a straight line to the next plant. This is because a striaght line leaves the previous plant too fast for it to register, so instead of slowing down, i just go in a more roundabout way to not make it look lame. Homer surprised me with the watering can star where he clips right into it through the ground. That was really neat to see. Slight route change on the 100c to collect 2 more giant goombas at the start so that we don't have to kill a whomp after the maze portion, saving about 100f in total. The only pre-reset 100c stage to sync. In fact, all 7 stars synced. We didn't have to redo anything here :). Star 5's blj on the pillar was an accidental find. I was trying to slide down that pillar to land on the next one so that we didn't have to open the cannon at all during the 100c star. ( ~8 second save). I ended up hitting and invisible wall and thought "aha! i can blj here". Really nice to find something like that, though i don't very much like invisible wall bljs - they just feel like cheating to blj on "nothing". Star 6 is a treat. I had to find where this star was hidden underground, and it was near some stage geometry! I thought, maybe with a bloated bob-omb, we could clip down here. Turns out, we could do it with a regular bob-omb, which means our flying doesn't get impaired when we're flying handsfree with him. The entirety of the star is just very satisfying to watch. This stage was one of the very first sm64 hack stages i ever attempted. We definitely improved a lot since then, fortunately. The 100c here was really fun. There was a route change inside the pipe where we collect an exrta line of coins and a goomba to the right. This eliminates the need to kill a bad RNG goomba towards the end of this inside area, as well as either a chuckya or an out-of-the-way post run-around (which we can do in 1 jump - that's how out of the way it is). Also some funky moves to the last coin during the flying part. Keep an eye on the 1f double jump grind we do after collecting the 100c star, is pretty optimal! Shoutouts to Sharkey91 (sm64ds taser) for finding some small improvements here as i streamed the 100c tasing live. Sadly, there were no blj spots in this stage. That would've been monumental to collecting the coins assuming we'd have enough speed to clip through all the walls. We had to open up ToadsTool64 to get a cross-section of the maze to route (and tas!) where to go. Overall it's kind of ugly, but so are maze stages. The HUD is slightly inaccurate here: it only displays 1 star despite there being 2 within the stage. The final stage before the reset! Woohoo! This was the actual last stage we had to touch before we were finished (since everything post-reset resynced with the run). The red coins desynced at the thwomp, so i had to do some RNG grinding to get him in a good spot. I was mostly out of options that didn't include me losing time, before i tried 1 last thing at the stage entry - i didn't turn around to face the pipe. I was still able to tie the speed of the entry, and my RNG for the thwomp came out to be much better than the original, allowing me a 10f save! Was happy about that. For the B2 fight, we cannot use Eru's blj strat (or more accurately, it doesn't help here) since the bombs are A high up in the air and B there's only 1 on the opposite side of where bowser stars. This is probably my favorite stage (TAS'd). So, the original concept of ascending this cave is: after some platforming, there are water switches (disguised at hearts in this hack for unknown reasons) which raise/lower the water level (like in wetdry world). These water switches are at the end of the platforming paths and need to be touched to progress, as the gaps from platforming area A to platforming area B are far too great to even attempt to jump over. Well, after very careful planning and speed usage, we were able to get a niche HWSK going. I originally wanted to use a C^ bounce on the ship that we blj on, but i don't think any of the slopes are steep enough. With the help of the pink bob-omb and a really precise jump, we were abot to engage HWSK. This is used for 3 of the stars and is especially important in the 100c star. The 100c star is crazy. So, as explained, we don't want to do this stage normally. However, the red coins are placed about on the platforming areas and no amount of precision will enable us to collect them during the HWSK, especially for the one in the Pipes Star area. This is where it gets crazy. We collect a few coins that are on the way towards the blj area. Then, we blj like normal and ascend to the very top like we did in star 1. Now, we jump back down, but on our way, we tag the topmost water tap to start raising the water to the top. Now we're on a race. There's an area at the very bottom with a red coin and some other coins that we need to get to before the water level does. We descend all the way down, collec those coins just in the nick of time, and now since the area is filled with water, we can collect all the aforementioned platforming coins via swimming, and without the need to go through the dips and dodges of the stage's original playthrough plan. I hate this stage. So far, you've heard of just-right times where our plans worked out fabulously. Well, this stage is a failed attempt of those and i didn't really want much to do with it afterwards. There's a star which requires the cannons to shoot from island to island. Remember the cannon cover blj in the Boo's Tower stage? Well, we can do that here too. And just our luck, the cannon covers perfectly face the islands in which you need to traverse! Sadly, there is a maximum speed you can get on these cannon covers, and it wasn't enough to traverse all of the islands. Bummer, would've saved over 50 seconds if it were possible. The routing of the 100c star here is pretty unique - as is any route in which a blj supercedes traversing a part of the map, essentially "connection" two faraway points. Not much to say. Regular slide stage. Shoutouts to Homerfunky for figuring out that the invisible wall doesn't extend all the way, allowing us to bypass the whole slide for the race part if you're angled just right. Also, similarly for the red coins part, to actually skip the "race won" star spawning scene by just skipping over the finish line to the side. This is the one. This is the stage that took the most of our time. Homer was on vacation at the start, so myself and recently joined the project sm64expert were on call here. Oh boy. So we did up to the 100c. This 100c is the bane of my existence. It's the most RNG heavy star in the game, just behind Scorching Desert's 100c. Everything has to line up. So, this is the stage you'd want to not have to redo the most, right? Lol. This was the star that had the most renditions of any star. So, after sm64expert and I fought tooth and nail to get all the RNG just right - being the scuttlebugs in the beginning followed by the spawning of the coins from the scuttlebugs and shyguy right before the pipe - but most imporatntly, the Mr. I coins in the next room. They need to fall out perfectly, so rng grinding was extremely heavy here. Also, the goomba at the very end needs to be in the right spot, and also spawn his coin in just the right trajectory so that we can star animation cancel the 100c star with the secrets star - homer came back. He improved the 1st and 2nd star we did on this stage. This means, the 100c will now desync. Ok.. so we redo all that tooth and nail from before. Now "I" found a major improvement to an earlier star.. queue redoing the 100c again. Now sm64expert finds some other improvements, so i don't do the 100c. I wait for more improvements. Weeks go by, months, no improvements. Ok, time to redo the 100c. I do it yet again.... and homer finds some more improvements. UGH. This stage, no - this star, took months to finally complete. Stars 4 and 5 were really cool to see the blj be drastically improved to make clipping a viable means to collect these stars. The reds is done by itself because it has a whole area exlucsive for reds. The blj on the elevator has an improvement found by Homerfunky where he uses the flyguy to get the topmost coin instead of waiting for the elevator to get there. Really nice find by him. The downside to not doing the 100c here is the blue switch is missing in place of a secret for the secrets star, but ultimately you traverse more of the stage (and subsequently, pass more coins) doing the secrets star. The final stage we do before bowser. This was mostly the work of homerfunky and sm64expert, though i did help out on some. This stage is vast but filled with death spots instead of just plain space like the bob-omb stage has, so it's fun to play. There are a few blj-friendly stars, but they are ultimately slower than the normal way, save for the slight blj in the 100c. This stage was exclusively Homerfunky and Sm64expert - i have no inputs from here on out. That's not to say i didn't try, but the few inputs i attempted ended up being improved, good job to my 2 partners here. The blj for star 129 is wild, really precise to stay on those platforms and be able to sneak past the wall at the end whilst in the opposite facing angle such that to collect the star afterwards. The GWK fest on the 130th star, the reds, is homerfunky i believe. When i saw that, my jaw dropped, one of the craziest series of GWKs. Usually, you can't do them back to back like that, since you have to come from outside of the corner to do them, but once you do them, you have to be inside the corner to not bonk. This can be bypassed if you go above ledges - which there are a lot of here - because you can't bonk on ledges. This lets homer pull back out of every corner just right so that he can come back in for another GWK, and another one, and another one, and ANOTHER one. A tiny thing to mention is the pipe clips. It's hard to tell if you don't TAS this game (and wasn't present in the first TAS of the stages but was added in during the re-tas), but basically, you can jump into the corner of a pipe with such elegance that you clip through it, which is slightly (1-4f) faster than jumping into it normally. The most noticable pipe clipping is the re-entry into stage 5 (Fiery Factory). The first star collected, big thanks to MarioGohan. Known improvements: Most things rng-dependent that could be in a better position, most notably, star 6 of course 14, or either: coins spawning from enemies, or the position of the enemies themselves. Mothrayas: Replaced movie file with a 1-frame shortened version. Fog: As this submission is using a hacked version of an official game, it gets judged a little bit differently compared to normal runs. Looking at the quality of the hack itself, it's not an extremely great hack. However, the contents of the hack are definitely different compared to the original Super Mario 64 game. Comparing this hack to the already published Super Mario 74 run, the hacks are distinguished enough from one another that having both published alongside each other is acceptable. Although this Super Mario 64 hack is not the greatest hack in the world, there is no doubt that the quality of the submission itself is top notch. Reception was great from the audience, and I enjoyed the run as well. Accepting to Moons as a new game!